Creating Max/MSP/Jitter patches can get messy fast. You can create labyrinths and hierarchical monsters full of objects, subpatches and externals. Sometimes writing it down in code is more elegant. Disclaimer: This guide shows the steps i followed when creating my first java jitter externals for Max/MSP. It is far from a comprehensive guide, it might not work for everyone and especially not every operating system, but it worked for me. Note: This is a Windows-7 guide. 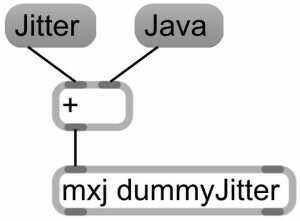 Java objects for Max function with the mxj external, which builds the connection between your Max patch and your java code being executed in the Java Virtual Machine (JVM). Be aware that there is a little bottleneck of 1 microsecond for every package that is passed between your [mxj] object and JVM. 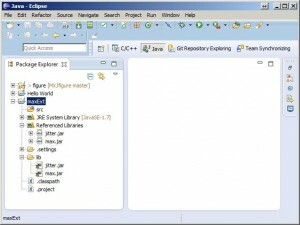 You need an development environment to write and compile your Java code. 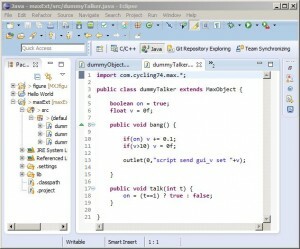 Eclipse is free, open source, popular and cross platform. 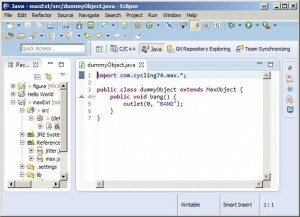 Download Eclipse Classic 4.2.2 (JUNO) at eclipse.org/downloads. 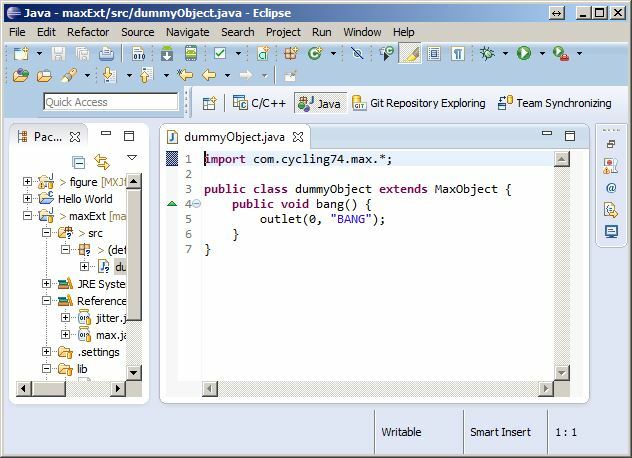 As alternative: Eclipse IDE for Java Developers should work too. 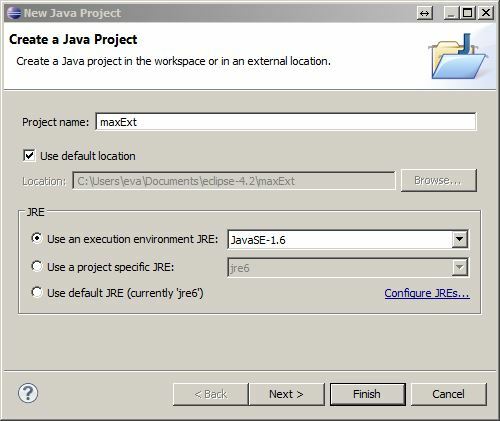 Select the approriate Java Runtime Environment (JRE) when creating your java project. 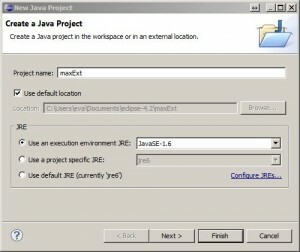 Create a new project by: NEW > JAVA PROJECT, name the project, select the appropriate JRE (most likely JavaSE-1.7, but if you want to use your externals on older computers choose JavaSE-1.6) and click finish. Once you added the jitter.jar and max.jar to your project’s lib directory, and added both libraries to your build path, your package explorer should look like this. 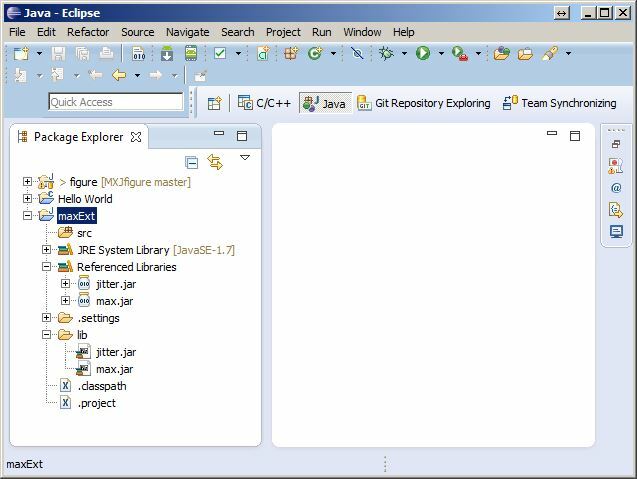 Create a lib folder within your Java project. Add both libraries to build path by right-click: BUILD PATH > ADD TO BUILD PATH. They will now be listed under Referenced Libraries. Settings the directory and filenames of your SSH key for the Eclipse and Git integration. 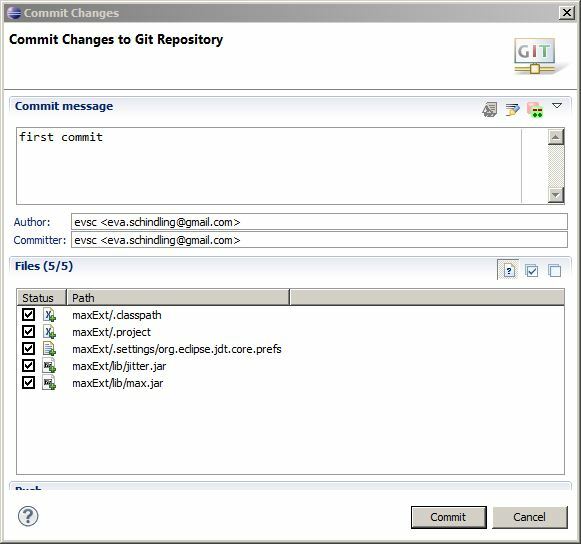 I am squeezing the Eclipse+Git setup and github linkage in between here, as it changed my folder structure, which will effect the other upcoming steps. More setup help at the EGit User Guide. Verify your SSH settings in Eclipse by: WINDOW > PREFERENCES > GENERAL > NETWORK CONNECTIONS > SSH2. Verify your SSH2 home is C:\Users\eva\Documents\.ssh. 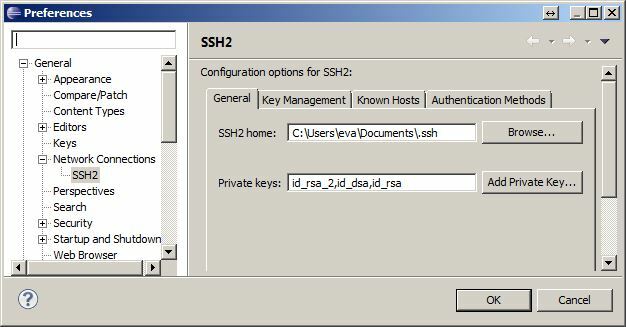 For this to work i had to create an additional SSH key that is only for Eclipse (in addition to my computer’s usual SSH key). Right click on project and: TEAM > SHARE PROJECT, select Git, click ‘Create’, Parent directory will be C:\Users\eva\Documents\git, name it, and click ‘finish’. Setup your Destination Git Repository with the github project’s SSH URL, ssh as protocol, git as User and no password. Click ‘next’, if connection successful, accept the host key, enter your SSH key’s passphrase and continue to push commits. 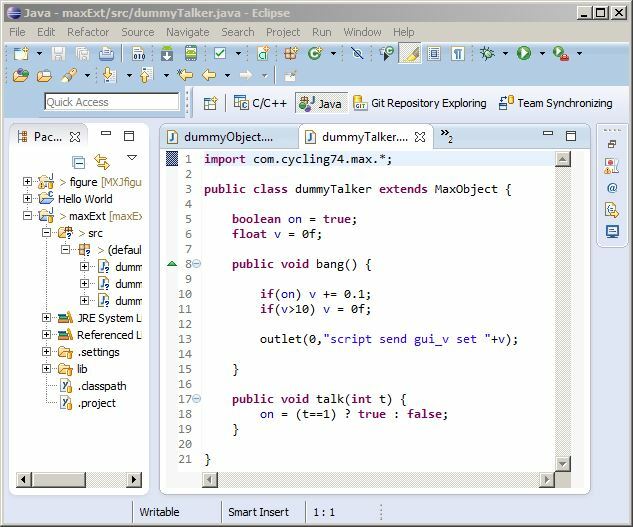 Write a first dummy class for testing purposes. No jitter functionality for now. Create a new class with NEW > CLASS, give it a name and click finish. First you need to tell Max/MSP where it can find your Java externals. 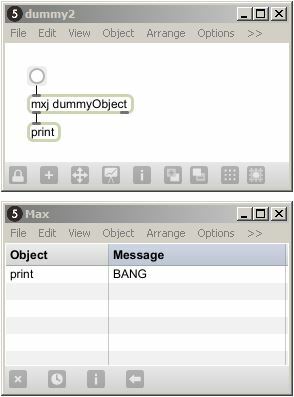 Add your object [mxj dummyObject] and see if it works. 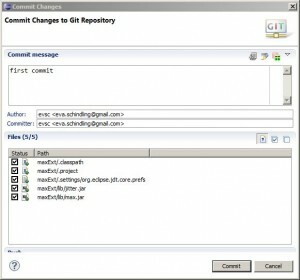 Go back and change your code in Eclipse. Make sure to save, so it autocompiles the new class file. Delete your object in your Max patch, and immediately undo the action. Now the class file has been updated in Max’s memory as well. 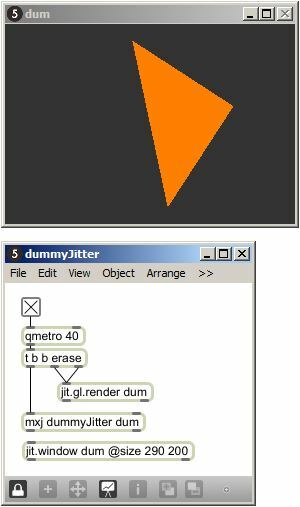 Now let’s test if our java class can also create jitter objects, and draw simple geometry with the [jit.gl.sketch] object. 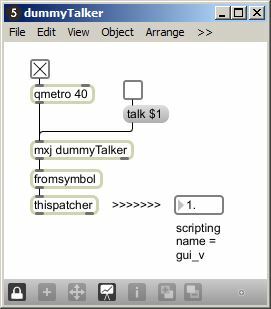 Create a Max/MSP patch with a [jit.gl.render] object, a [jit.window] for showing the graphics, and your [mxj dummyJitter] object. Give them all the same render context, run a metro and see if you see the spinning triangle. Triggering functions within or sending values into the java object, is straightforward. All you need to do is send in messages in the left inlet. If you want to have the java object communicate back to the patch, you can use the outlet() function. An elegant way to update GUI elements with values from within the java object – without having to make connection lines – is by using script and the [thispatcher] object. Create a number box, and assign a scripting name to it. Connect a [fromsymbol] and a [thispatcher] object to the left outlet of the java object. Posted in Tech and tagged eclipse, java, jitter, maxmsp.